​Now a days the first question my florist asks me is – the decor will be traditional or contemporary. ; cake designer asks modern or vintage, tent person asks – Over the Top of Minimalsitic. The events and especially weddings in India are not just the events any more, they are the expression of bride and groom’s tastes, vision, style, preferences and personalities. ​And here comes the Pinterest which is s growing fast as a social media site. Moreover, it has a big following of females and especially would be brides.​ Wedding planners, wedding photographers use Pinterest to show off there expertise and win over those brides. If you are new to it, this site is a collage or an interactive scrapbook where you can share as well. Here you dont have to cut images from magazines or bookmark so many web pages just to get that one look of make up; you just pin the inspiring images onto your board. You can have as many boards and even Secret Board (Pinterest recently launched Secret Board). 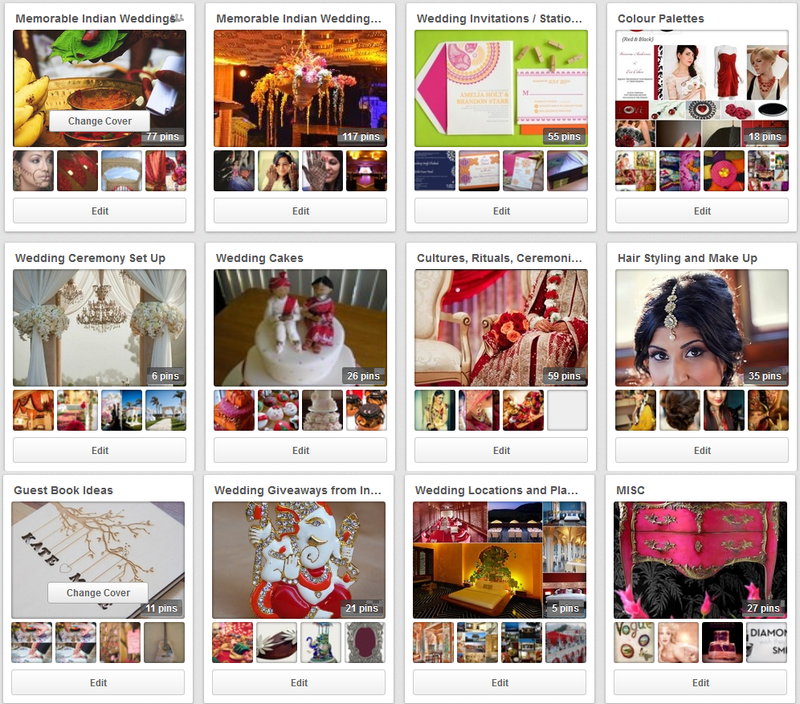 One can categorize boards like Wedding Invitations, Make-Up, Wedding Trousseau, Decorations etc. And then pin your inspiring images to your respective boards. Not just that, as its a social bookmarking site, you can always follow other boards and pin images from them. You can share images, follow users or boards, make comments on pins, like pins, repin pins and even tag users. You can also invite people to pin to your board. To make it easy just install Pin it button right into your browser in one click and you are free to pin from across the web you browse. Just click on the Pin applet and it will find the Images and you can pin them on to your board. Let’s start pinning, leave those magazines and wedding blogs aside (yes almost of all them are on Pinterest to inspire you). We would love to see your pins and would love to get inspired from them!! PS. Too much of everything is not good, so don’t try to make or visualize your wedding as you see it on Pinterest, those are touched up images, made to look good on web. Just get the inspiration, ideas and design a unique wedding event for yourself.